Come learn what it takes to train a well-rounded, hunting or adventure partner. Topics include obedience, steadiness, promoting calm behaviors, patience, introduction to birds, memories, doubles, early marks, reading your pup, k-9 demeanor and much more. Bring your pup, all breeds are welcome. The course will cover the Wildrose method of the gundog’s obedience to hand signals. Emphasis is on developing the handler's skills while avoiding shock collars. Focus topics: canine behaviors, reading your dog, delivery, whistle commands, steadiness, handling, hunting cover, and lining, all based on Wildrose training principles. This course will focus on the Wildrose positive methods for both upland and waterfowl retriever handlings, including hand signals to blinds. 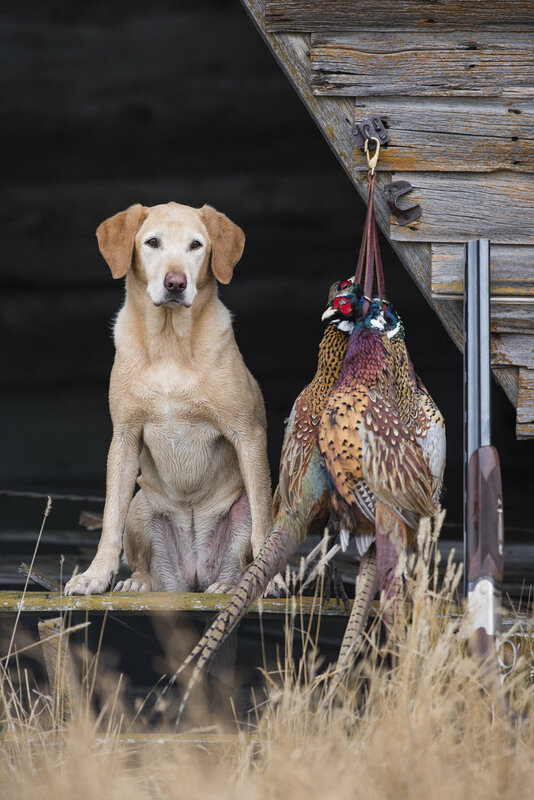 The goal, advance the handlers' skills for transitional training and hunting situations based on the Wildrose training principles. Topics include: handling on water, advanced steadying drills, upland walk ups, lining on multiples, memories (circle) and blinds. This is the course to evaluate gundog skill levels and tune up before season or a competition. Three days of wingshooting scenarios with live bird flights combined with training clinics. Double guns, 16-gauge and below, are used to provide a traditional sporting flair. Transitional exercises with live birds will include flights over water, flooded timber, field shoots and walk ups. Some sites may offer hunting over pointers as well. 1/2 day hunts followed by 1/2 day training clinics that will address training needs. Open to all breeds. Come test your dogs skills and work towards your Adventure Dog Certification. Adventure Dogs need specialized training given the activities they may encounter. This course includes training for skills like: hiking, climbing, mountain biking, backpacking, camping, running, canoeing, fishing, horseback riding, etc. This is training for companions that will complement a sporting lifestyle. Our "Wildrose Way" courses appear at various sites across the country. Prices vary according to location. These are highly interactive, progressively presented dog training clinics. Wildrose shares our unique positive training methodology, which has gained enormous credibility among hunters, adventurers and competitors alike. Learn, firsthand, the methods used to train Drake and Deke, the Ducks Unlimited mascots, as demonstrated on many television hunting programs including DU's World of Ducks and Benelli's American Bird Hunter with Tom Knapp.